KitMonsters – ESKA. The music makers’ guide to making music. 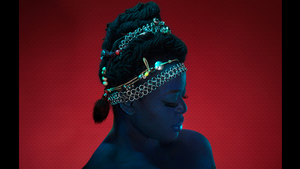 ESKA’s dazzling debut album landed a place on the Mercury Prize shortlist, to the delight of fans and many fellow musicians. ESKA has distilled her varied influences, styles and instruments into a remarkable piece of work, with plenty of playfulness. 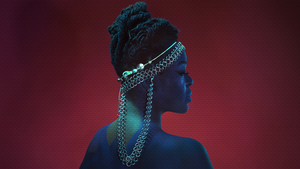 Eska Mtungwazi’s album - ‘ESKA’ - builds on her years of working with artists such as Nitin Sawhney, Courtney Pine, Ty and Tony Allen. She weaves together soul, psych, dance dub, folk and more, and BBC Radio 6 Music tastemaker Gilles Peterson says she is “the finest UK singer”. We caught up with ESKA to talk about recording and producing the album, and the unusual hand-made instruments that feature. The album is available as a download, on CD and vinyl. ESKA’s debut album is a joyful musical journey, that moves from the playful, percussive, ‘Shades of Blue’ - one of our favourites - to the more dubby feel of ‘Heroes and Villains’. Weaving together diverse musical styles, and sounds from instruments across the world including some hand-made by her musicians, it’s unique. This year’s Mercury Prize is being held in association with BBC Music, and we asked her what nomination has meant so far. It’s been an extraordinary boost to audience development really. That’s the thing that every artist is hoping, that they’ll have a further reach, that there’ll be more people interested in their work. Three days in to the Mercury there was an NME headline that said that my Spotify listenership’s three million, gone up by three thousand percent. Things like that are really extraordinary, overnight people just wanting to engage with your work because of an award like this. I think that’s mainly because it’s an award for creative endeavour and not sales or popularity. It’s really down to the work, and so it’s really exciting to see people want to engage with this who’ve never heard of me, would never come and see me perform live before, and that’s so exciting. ESKA has worked with other artists for many years as a singer, so how is she finding the transition to fronting her own project? It still takes me by surprise, it still feels like a challenge. It’s exciting to feel like there’s something to have to step up to and something to reach for, creatively and artistically. I think when anyone’s hitting the ceiling, creatively or artistically, you can just get stale, lose interest in your own work and so, to suddenly have this opportunity to be nervous again about life and these opportunities, is really quite thrilling and it feels like there’s an opportunity for growth, which I think is very important. People had been trying to persuade her to make her own album for years, but the time hadn’t been right. There was a string of people, artists, managers, labels, along the way, trying to persuade me, but it was premature. Trying to pursue my authentic self took a few more years before I felt like I actually knew what my artistic voice was. Because being a collaborator, you’re learning someone else’s language as it were, music language, and my head was full of that, I hadn’t distilled who I was. I knew that I was going to transition and say ‘yeah, OK, I’m stopping being just a musician and I’m going to be the artist’. I knew it would take a process of decluttering my mind from all the voices that I’ve heard over the years. I gave myself 18 months to declutter. I had to go and figure out who I was, for myself, my authentic self, that journey was just as much about finding out my culture, really, coming to terms with my cultural identity as it were, before finding out what my creative identity was. 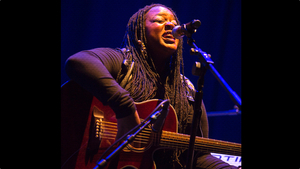 Born in Zimbabwe but growing up in London, and having played on the folk scene, as well as collaborated with the likes of Nitin Sawhney and Tony Allen, there was plenty for ESKA to distil. She was introduced to electronic composer and producer Matthew Herbert who played a big, but never intrusive, part in her voyage of self-discovery. It was wonderful to have someone like that to bounce ideas off who had no agenda in terms of how he thought I was going to sound. I felt confident that that relationship would help me on that journey because of the way he approached it. I mean our first meeting, he said to me, ‘you should go away and write music that sounds like what it feels like for ESKA to be alive today’. And also he said another curious thing, ‘I want you to be well’. I felt like he could see what was going on with me creatively and while he’d heard a lot of music in my collaborations, he also could see what others could see, that ‘that isn’t you, where are you in the midst of this? You’ve really got something to say, you just need to figure out how to do it’. He knew that I wasn’t creatively well and I needed to just get well and be at peace with myself and the way in which I create. The record to me is the outcome of me liberating myself from lots of other things in many ways. Matthew co-produced some of the tracks on the album and played instruments such as piano accordion and even a speak and spell machine. ESKA’s album defies genre, and if you ask her to describe her sound, she talks about the recording process, comparing it to tailoring. The record was put together in a slightly unconventional way and the music was recorded before the songs were even finished, which is considered back to front for most people. I was trying to find that new sound world, those things that would excite me and ignite visual, lyrical vocal ideas. I ended up putting the lead vocals down in the mixing so it was when we’d finally done the arrangement and done the production and I was clear, ‘OK, this is the world that this song has to live in’. Then I felt I could deliver the final vocal. For example in ‘Heroes & Villains’, initially when we recorded it, it was a real rock out kind of performance but any time I kept listening I just thought ‘no, I can’t deliver an authentic vocal to this, it doesn’t feel honest’, and so actually at the mix stage, I thought I wanted to get a dub reggae mood. My decisions about style and all of these things are really down to trying to tailor-make a place for the song to really resonate at its maximum. So I guess that’s why people are saying the record’s genre-defying or not easy to categorize. I was really thinking about each song as a bespoke happening thing, the voice and the narrative will bring the cohesion to the album. 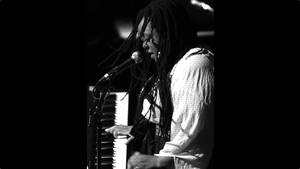 As well as singing, ESKA played a dizzying array of instruments on the album including prepared upright piano, glockenspiel, harmonium, rocks, grand piano, and synths. She says that one of her favourite instruments to play at the moment is the cuatro, a small four-string that’s not very well known in the UK. Well my little instrument that I fell in love with a few years ago is called the cuatro which is ‘four’ in Spanish, and it’s a traditional folk instrument played in lots of regions in South America. I came across it when I had a trip to Venezuela with the British Council and we got to collaborate with Venezuelan musicians in Caracas, they put on a big outdoor show in this beautiful amphitheatre. Essentially it’s like a bass ukelele, and it’s really petite, somehow I thought that would be easier to get my head round than a six string. It’s very much an instrument that’s strummed, but the way in which they strum, I couldn’t quite get my head around it, the rhythm, it’s just a curious way in which it’s used. I really like the tone of it, it’s quite distinctive. I remember around the various scenes that I was singing in, there seemed to be a bit of a ukelele explosion. I didn’t really want to be another one so that was me being a little bit subversive. ‘Yeah I play a Venezuelan axe actually’, I’m quite chuffed. So I attack an arpeggio on it and don’t play it in an authentic South American way. I actually found new songs from playing it, new ideas to pull out, just because it has such a curious sound. I love it very very much. ESKA was given a cuatro by a London-based Venezuelan singer-songwriter Luzmira Zerpa, lead vocalist in Family Atlantica and is playing her cuatro on ‘She’s In The Flowers’, for this In The Woods 2012 Barn Session. ESKA’s recording process was unconventional but brought out her talented band members’ spontaneous side. We recorded 19 songs over a 10-day period, one song in the morning and one song in the afternoon. I also deliberately didn’t play any of the music to the band, we had no rehearsals for these recording sessions. The band would be played the song at the beginning of the session, we’d have a few listens through. We’d then make decisions about the instruments, who was going to play what. They all play lots of different instruments so it’s nice to swap sometimes, get a different kit, and then we’d discuss what the production was going to be. There was plenty of experimentation - the track ‘Rock Of Ages’ features ESKA and five other band members playing real rocks, and the vocal arrangement feels African in style. The album opens with otherworldly sounds on a soulful track called ‘This Is How A Garden Grows’. ESKA told us the amazing story of how her band built instruments for the recording - on a very limited budget! What the listener hears is a home made band basically, playing home-made instruments. I think the only people at the beginning of the record who were playing real instruments were myself, I was on Wurlitzer, and the guitarist, David Okumu was on electric guitar. I gave everyone ten pounds to go to, I think it was B&Q next door, and find things to make their own instrument to play. So much fun! So the guitarist (Al Cherry) had to make his own guitar and the bass player (Robin Mullarkey) had to make a bass, and the drummer had to go and find bits from off the street and whatnot to make a drum kit. He made lots of the drum kit out of rocks and stones. The bass player got a big bucket, a garden bucket, and used a broom handle and a strong piece of string to make what we call a tea-chest bass. He’s a seriously virtuoso bass player but to hear virtuosity played on a tea-chest bass, was mind-bending, it was really extraordinary. I know one of the guitarists was using a wooden rectangular box and he made a bridge with his iPhone and then put strings across. There were some really amazing moments and things that were made - getting glass bottles and putting different levels of water in them, like in primary school. Tom Skinner on drums was smashing rocks together to get the sound of a snare. 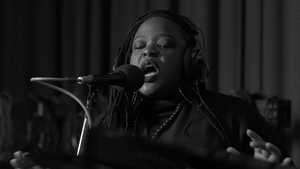 ESKA played the song in a session at Maida Vale Studios for Jamie Cullum’s BBC Radio 2 show, a more pared-down version. One of the studios ESKA recorded in, Fishmarket in London, is run by drummer Antonio Feola, and was full of new things she could try out. Why it’s so special is because it’s run by someone who’s very passionate about analogue gear. It’s wall to wall with the most incredible instruments. He has an actual D3 Hammond with a Leslie amplifier. He has Wurlitzers, Rhodes, pianettes, all manner of things, Vibraphones, several drum kits because he’s a drummer. It’s the most extraordinary den. Really, you go in there, you want to play everything. So it was great because when we got there, even though I’d arranged things in Logic and I had an idea of what I wanted them to be played on, I often would make decisions on the spot like ‘Oh yeah why don’t we have Vibraphone on it, this will be really fun’, just because it was there. We ended up having pianette on several tracks. I mean I didn’t know what a pianette sounded like. It was there and we thought, ‘this is extraordinary, it’s so unusual, it doesn’t quite sound like a Rhodes, this is so cool!’ And you’ve got a harmonium in there and all these things. It’s like a musicians’s sweetshop. We had so many wonderful analogue keyboards at our disposal, we also had an incredible range of microphones. 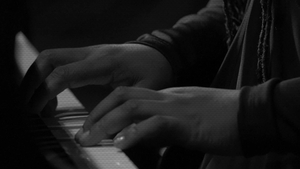 He’s got a beautiful Yamaha grand piano as well. On a couple of tracks we put metal and paper on the strings so that we could have unusual sounds. ESKA, Executive Producer on her album, was determined to keep the recordings sounding human and authentic. On a classic album like Miles Davis’ ‘Kind Of Blue’, you’re hearing only the first or second take, they didn’t rehearse, and there’s something about that, the way in which incredible musicians play in their first, second take of something that’s really really really special. So I was trying to always capture that in the recording process. It’s a magical thing. We didn’t really refine the takes on any track, we didn’t quantize it and correct it. We checked every take and just kept tape running and built the production up on that. I think that’s probably why it sounds, ironically to me, unusual to some people’s ears. Contemporary quantizing of everything almost dehumanizes music, you know, ‘we want a pristine vocal without any notes falling off, crack in the voice’, or ‘we want the drummer to be as tight as a metronome’. A lot of the great music that was in the 60s and 70s certainly, people were just all in and they played it, you’d hear warts and all, and there’s something really delightful about that sound. 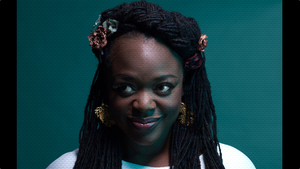 ESKA had co-production help from Matthew Herbert and David Okumu, and mixed the album with Louis Hackett. I learned a lot with Louis and I owe a huge debt of gratitude to him, it’s really important to acknowledge him as a co-producer. I think one of the biggest lessons I’ve learnt in making this record is that it’s one thing recording a song, writing a song is another thing, turning a sound recording into a record, it’s a very different thing. Making a record of it is what Louie really supported me in doing. But it was ESKA herself who had the final say and overall creative control, and she feels it’s important that people know that, especially women. My involvement in my record, not only as a songwriter but as an arranger, as a producer, I think that’s an important story to tell, and it’s an interesting story particularly within an industry where women often, in terms of their production, it gets overlooked. It’s really discouraging I think for other women because they don’t realise that they are able to have a voice in the studio in that way, they can have ideas about the processes they put their instruments through. That’s something that women should get involved with if they want to, it doesn’t just stop at writing the song and singing it. It’s a dark art being a producer, often people think it’s to do with writing a song or arranging a song, you have to know where middle C on a keyboard is. You don’t have to play an instrument to be a producer. It’s about how a record sounds, I’m talking about the overall sound and making sonic decisions in the studio, that’s a very different thing, and often I think women can get intimidated by all the technical razzmatazz that goes on in a studio. ESKA has earned her producer stripes, and is embracing a different kind of razzmatazz. She’s already in demand as a magazine cover star, and is looking forward to the Mercury Prize awards night on 20th November, broadcast live on BBC Four at 9.30 pm, as well as her next live shows. ESKA - the album is available as a download, on CD and vinyl.